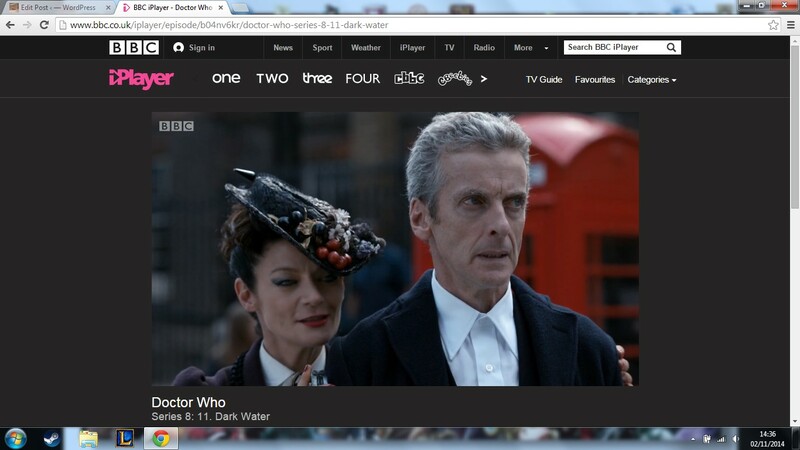 Last night saw the first part of the Doctor Who finale air. It is easily shaping up to be my favourite season finale, along with Journey’s End and The Name of the Doctor. However, this is not going to be a review. I have something I need to debate about with anyone who has seen this episode. But before that, I need to inform everyone who has NOT seen the episode to stop reading and watch it, as I am going to reveal a huge plot development. And even if you have, watch it again as it is pretty awesome. So, everyone seen it now? Ok, so let’s talk about Missy. Doctor: Obi-Wan said he killed my father! Missy: No, I am your father! Now that we’ve established that the Doctor’s father is… wait. Sorry, wrong sci-fi franchise. In reality, it turns out that Missy is the Master. The Doctor’s arch nemisis, The Master is one of the most iconic Doctor Who characters. He has been menacing the Doctor since the Pertwee era for over 40 years. He was last seen in The End of Time Part 2, where he sent himself, Rassilon and the other Time Lords back to a war-torn Gallifrey. And now he/she is back in a female form. Obviously this has caused major controversy within the fanbase. Some love it, some hate it. I love it, but it’s the reasons why people hate the reveal that I’m interested in. One problem people have is the fact that the Master has always been male before. I would agree with this, but not only did the Doctor’s Wife establish that one of the Doctor’s friends changed gender during regeneration, but in the Eighth Doctor mini-sode The Night of the Doctor the Sisterhood said that the elixir could allow him to change into a woman. So there IS an in-universe explanation as to how he could change gender. Maybe a Time Lord can change gender by using special elixirs like the ones the Sisterhood had, or maybe the Master has perfected the regeneration technique. Quite WHY he would change into a woman for this incarnation is yet to be explained, but that’s the joy of two-parters. Another question is how the previous Master regenerated and how he escaped Gallifrey, but those are for next week. Another reason for some people is the fact that it brings the character and story down. How? In terms of this story, the reveal hasn’t affected it. There is no reason why having the Master as a female brings the story itself down. Regardless of gender, the character stays the same and the episode probably wouldn’t have changed if the Master had been male. That may sound like a complaint, but the fact is that in this story, the Master is Mistress. Maybe the next incarnation will be male, but for now, the revelation of who Missy is has created no problems within the story. If it affects how the character behaves and if it changes the Master completely, then it is right to complain. Complaining about trivial problems like the Master’s gender is not worth complaining about. Complaining about the actual story and characters is worth complaining about, if the episode is bad. But it isn’t (in my opinion), so I’m not complaining. The final problem people have is the fact that the Master has already been used in the revived series and is being over used. Except for the fact that his last appearence was four years ago with a different incarnation. While all the Master incarnations are similar, they are still different. The first Master (who is actually the Master’s final incarnation) is almost the Doctor’s equal. He respects the Doctor and is incredibly smart. The second version of the Master is a disheveled husk who is nearing the end of his life. By this point he is insane, as he tries to take over Gallifrey and later Traken. After he has successfully stolen a body, he becomes more elaborate and treats the Doctor as a distraction from his evil schemes. In the revived series, the Master has gone fully mad (due to the drums), but still respects the Doctor, giving him the chance to join his conquest of Earth and eventually saving his life. This new version is different again, though seeing as how she has only had half a story it is hard to pinpoint what makes her different from the other Masters (other than the fact that she’s a woman). She certainly seems a lot more calm than her predeccesor, and her plan feels like something straight out of the Pertwee era (The Cybermen descending the stairs of St Pauls is a reference to the Second Doctor story The Invasion. My dad thinks St Pauls is the Master’s Tardis). So, that is the debate: was it a good idea to make the Master a woman and for extension, was it a good idea to bring the Master back? I can’t wait till Saturday where all will be explained. I didn’t have a problem with the Master being a Mistress. In fact, i didn’t even occur to me that it might be a problem – but then I’m not a true whovian. In fact, I found it a good reveal – I hadn’t been expecting that sudden plot twist at all. I’m looking forward to the next episode to see how the threads will link together, and how the questions will be answered. Was everything in the episode all that it seemed?